Pacific Rim wasn't exactly high art when it debuted back in 2013, but it had Guillermo Del Toro and that counts for something. You had the sense that he was like a kid who had dumped out the entire toybox and was able to play with everything he ever wanted. There were giant robots, humungous monsters, cool suits, badass weapons, it felt like a Saturday morning cartoon sprung to life. 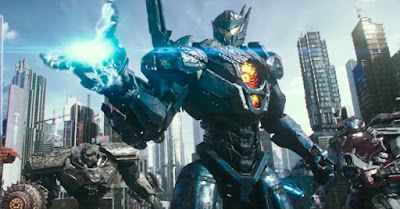 Del Toro's only around as a producer for the equally ginormous sequel, Pacific Rim Uprising, and that fundamentally makes it a different movie. That shouldn't scare you. If you want more rock 'em sock 'em Jaeger action than this will feed those cravings. I think the biggest surprise for some will be how little Del Toro is missed, because it frees up incoming director Steven S. DeKnight, best known for the awesome Spartacus TV series, to do his own thing without any baggage. Set 10 years after Idris Elba's Stacker Pentecost saved the world from gigantic invading Kaiju by sacrificing his life to close the Breach, the planet is still very much under threat. But Stacker's son, Jake (John Boyega), wants nothing to do with it. A washout from the Jaeger program, his life is that of a petty criminal and black market dealer specializing in Jaeger parts. The film begins by taking us through his irresponsible life of wild parties (at nearby Kaiju skeletons, naturally) and grand theft. That is until he's screwed out of a lucrative deal by Amara (Cailee Spaeny), an orphaned rugrat who has built a homemade Jaeger for herself that looks like a wannabe Bumblebee. When Jake and Amara are swept up by authorities, they are forced to enlist in a new battle against an unexpected threat. The Kaiju are back, but there's also a rogue Jaeger on the loose, and a suspicious drone program by a shady corporation that threatens to ground all of the pilots. Just like the first movie there's a density of plot that is completely unnecessary, and I haven't begun with the longtime rivalry between Jake and fellow officer Nate (Scott Eastwood, trying too hard to act like his old man), the grotesque place science nerd Newt Geisler (Charlie Day) finds himself in, or any of the dozen other subplots introduced and given short end of the blaster. The typical sequel clichés abound, too, but honestly it doesn't hurt a movie like this where we kind of expect it. Jake is the reluctant hero trying to live up to his father's legacy while being his own man, yeah, we get it. Some of the original cast return, like the aforementioned Charlie Day, Burn Gorman as his fellow nerdy misfit Hermann Gottlieb, and Rinko Kikuchi as Jake's sister, Mako Mori, now a leader in the Jaeger program. They don't quite fit this time around, though, and their presence feels more perfunctory than as essential parts of the plot. But Boyega kills it as Jake Pentecost, doing a much better job as lead hero than the half-awake Charlie Hunnam did previously. Spaeny is also a plus, bringing a youthful energy that reminded me of Ellen Page's early career. But it's the smash 'em up battles that people really care about, and those are different than what we saw previously. DeKnight has done his homework, too, clearly drawing inspiration from Dragonball Z and dare I say Mighty Morphin Power Rangers for fights that emphasize hand-to-hand skills over cool weapons. I'm still not a fan of all the "neural handshake" lingo that bogs down the action, but whatever it's Pacific Rim lore by now. It's also a pleasure to actually be able to see what's going on as DeKnight stages the most critical fights in the daylight rather than the heavy, rain-soaked cover Del Toro deployed to hide some of the technical deficiencies. Uprising is clearly working on less of a budget but DeKnight isn't afraid to show what he's working with, and the robot vs. monster mayhem delivers. If only there were a bit more of it. Without giving too much away, the only major Kaiju battle doesn't occur until late in the film while surprising new foes occupy most of the earlier battlefield space. Assuming this turns out to be a trilogy, because that's what every blockbuster aspires to be, Pacific Rim Uprising is a surprisingly upbeat middle chapter without the doom 'n gloom. Nobody is going to go home smarter for watching this one but you could do a Hell of a lot worse. Did you see that last Transformers movie?